Interestingly, the Bible doesn't ever just say that God loves us. Instead, it says: "God demonstrated his love..." "In this is love, not that we loved God but that God loved us and gave..." "For God so loved the world that he gave..." Love is more than emotion or intention. True love, redemptive love, God-styled love is active; it does something. For us, Jesus did more than something; he sacrificed everything. What's more, he did it when we most needed it. 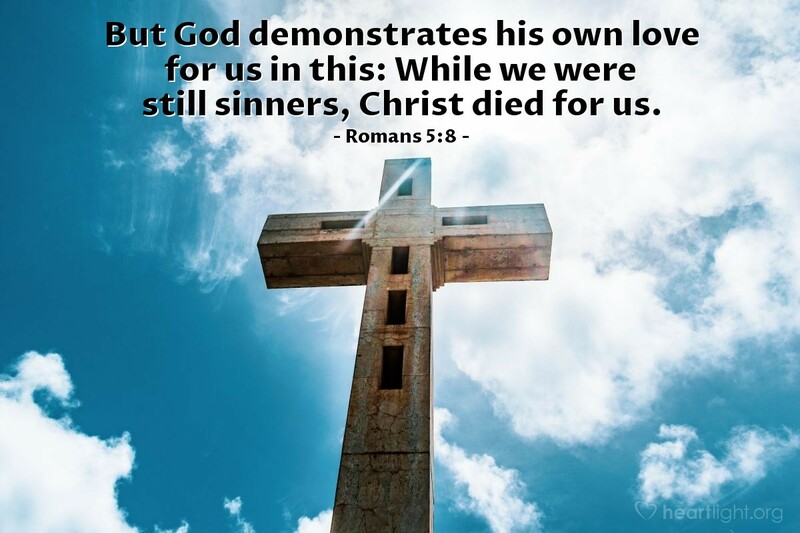 He demonstrated his love when we were sinners! Father, thank you for loving me. I love you. I love you for what you've done. I love you for who you are. I love you for your promises. I love you for your faithfulness. Most of all, dear Father, I love you because of Jesus who showed me just how much you love me. Please empower me to show my love by serving and giving to others as Jesus did. In his name I pray. Amen.